Images of background posters at bottom of commentary! I don't want to elaborate too much at this point, but this page was a super late addition to the overall script. Considering the page's significance, that fact is somewhat baffling. I'll elaborate more on it later. I was tempted to add in a bit of narration to make clear that this was later in Junior High, but all the cool kids were all like "show, not tell", and sometimes people miss time narration boxes existing anyway. As such, I intended Diane's hair length to indicate "this is a some time later". I guess Lucy's hair, too? Hair = Calendars now. 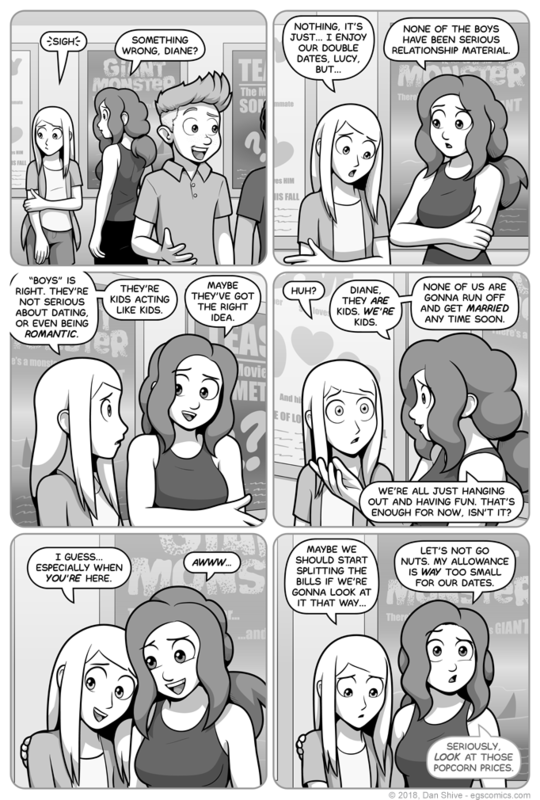 Speaking of which, I think it's safe to say hair grows faster in the EGS universe. If Diane's hair would grow about six inches a year in our universe, you can bet on a foot a year or more in EGS land! Why? Because people have dramatic long hair needs, darn it. Also probably magic or whatever.